1861 Retour - Receipt from Graz to Most, franked with 19(!) stamps Franz Joseph 2 Kreuzer yellow, CDS GRATZ RECOMMANDIRT 14/11 and BRUX 19/11; signs of age, however magnificent entire with certificates F. Puschmann and Dr. Ferchenbauer (RRR! ..."einmalig"); unique cover, scarce! 1851 Mi.7, Yellow Mercury 6 Kreuzer, type Ib, cancel. 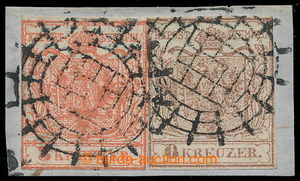 GMÜNDEN 27/4; wide left and lower margins with part of adjoining stamp, upper and right margins cut to margins, in right margin thin place (usual), "schönes Stück", certificate Ferchenbauer, exp. Mayer, cat. Ferchenbauer 12.500€, attractive piece of Austrian classic! 1863/64 Ferch.21-23, block-of-16(!) Eagle 5-15Sld, perf 9½;; with wmk - 1x LADURNER, 11 complete characters from wmk BRIEF - MARKEN; perfect quality, cat. min. 6.800€, very rare! 1879-1894 Ferch.1I, Coat of arms ½Kr black LITHOGRAPHY, complete sheet, imperforated PLATE PROOF; folded (strengthened) at top with IMPRIMATURI 24.8.94; hand obliteration against misuse, notice LITHOGRAFIE , EMISSION 1894 etc. ; only this complete sheet recorded, rarity! 1879 Ferch.8I, Coat of arms 20kr olive green LITHOGRAPHY, complete sheet, imperforated PLATE PROOF, marked MUSTER 21.11.94, hand obliteration and notice and signature from K. K. Hof- and Staatsdruckerei, in addition very important notice about color "1 Theil Ultramarin, 1½; Theil dunkel Chromgelb"; only this unique complete sheet recorded - unique rarity for greatest collections or exhibits! 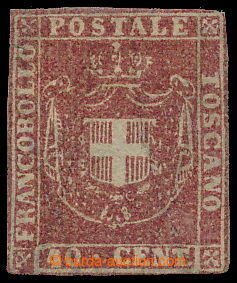 1864 Mi.10II, Coat of arms 30Para, horizontal BLOCK of 6 with turned and inverted cliche, cat. min. 16.000€, (included to sum only as 2 pairs turned by 90°); very rare block, ex. Rieger, important classic rarity! 1840 PLATE PROOF PENNY BLACK "Rainbow Colour Trial", SG. Spec.DP20/2c; without characters in corners and with "voided corner", dark red-brown; very fine piece with plate variety - tiny dash, rare speciality, cat. £4.500++, extraordinary offer! 1840 PLATE PROOF PENNY BLACK "Rainbow Colour Trial", SG. Spec.DP20/3a; without characters in corners and with "voided corner", dark blue on white paper with prussiate of potash; very fine piece, cat. £4.750, extraordinary offer! 1877-1880 SG.7, 9-13, 20 (Scott 1-8), EXPRESS 1P-5Sh, all with CDS APIA; very nice quality, cat. £2.700; unrepeatable offer, very scarce! Pof.4Ms(2), 5h blue-green, SAME FACING 2-stamps unissued gutter, unfolded, upper stamp from plate 4, the bottom from plate 3, on stamp paper with gum; hinged, production folds in paper, right at top from front sides minor faults of paper; certificate Vrba, extremely rare vertical gutter! Pof.128Pz, Black numerals 5f green / black with right sheet margin with control-numbers and part of Opt on edge (with incomplete offset), combined perforation 15, wmk Pz, overprint type II. ; lightly hinged, well centered stamp and also overprint, certificate Vrba, exp. Fischmeister, cat. Pofis 40.000CZK, Mercure 45.500Kč, very nice and decorative piece! Pof.130Pw, Black numerals 50f green / black, line perforation 11½ : 12, wmk Pw - vertical, overprint type III. ; hinged, in upper left corner repaired tooth, certificate Vrba and Karásek, exp. 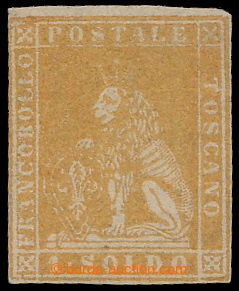 by Gilbert., Karasek, Vrba and old commercial marks Levec and Kratina, very rare and sought stamp, cat. 70.000CZK!